White, star-shaped flower bracts appear before leaves in early spring. Green foliage turns red-maroon in fall. Red, berry-type fall fruit is a favorite of birds. Grown single trunk. Available: B&B: 1 ¼", 1 ½", 1 ¾", 2", 2 ½"
Showy, creamy white flower-bract clusters beginning late spring. Fleshy red fruit in fall. Green foliage turns an attractive purple-red in fall. Single trunk and clump versions available, specify when ordering. Proven Winners® Color Choice®. New dwarf red twig with full branching. Minimal pruning required. Great winter interest shrub. Deciduous. Red twig with rapid-growing, loose, rounded, spreading habit. Bright red stems provide winter interest. Tiny white flowers appear in flat-topped clusters in late spring. Deciduous. Popular semi-evergreen with narrow green leaves featuring a striking golden margin. Fragrant clusters of small, tubular white flowers emerge in mid-spring and continue sporadically through summer. Adaptable to marginally fertile, well-drained soils. 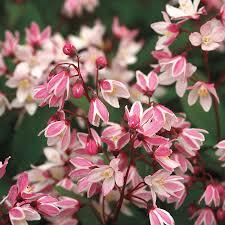 Dwarf, dense, rounded deciduous shrub which forms a graceful, spreading mound. 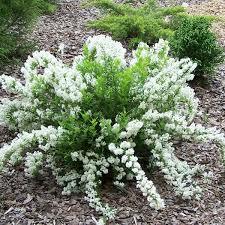 Tiny white flowers in small, upright panicles cover the shrub briefly in early spring. Medium green leaves turn an attractive deep burgundy in fall. More compact than the species. This Proven Winners® Color Choice® selection is a neat, mounded deciduous shrub feeaturing pink, bell-like flowers in spring and attractive burgundy foliage in fall. Tough and adaptable, makes an excellent groundcover. A traditional autumn favorite. Vibrant scarlet red foliage and small red-orange fruit in the fall as well as corky wings which flare out along its branches. Widely adaptable to varying soil types and moisture levels. No significant pest problems. Transplants very easily, and is virtually maintenance free. Deciduous. Fast growing, upright spreading habit. Big yellow flowers up the entire length of the stem. Tolerant of moist soils and adverse conditions. Can be pruned after blooming to maintain desired height. Deciduous. A Forsythia with year-round interest. Bare branches covered in a profusion of golden yellow flowers in early spring, followed by dark green leaves with clear silver venation. Arching, deep purple branches in winter after the leaves have dropped. More shade tolerant than other varieties. Deciduous.